What do toddlers love? Getting into EVERYTHING. That’s why I want my money to go toward products that will inspire my curious kids, entertain them, and last longer than three days. Therefore, here is my all-time favorite brand of long-lasting toys for toddlers. They’re well made. 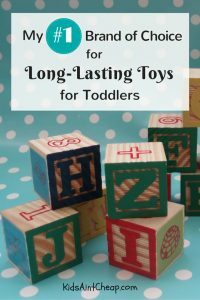 The durable craftsmanship of each toy and the use of wood and metal instead of plastic ensures that these are long-lasting toys for toddlers and older. They teach a skill. Each toy or activity I’ve come across in the Melissa & Doug line inspire the child to use her imagination, explore her problem-solving skills, or improve hand-eye coordination. They’re better for the environment. With the longer lifespan of each toy and the use of natural products instead of plastic, the carbon signature is greatly reduced. They help kids focus. My go-to toys for road trips, waiting rooms, or long lines at the grocery store are Melissa & Doug. With their colorful and creative designs, they hold children’s attention spans. That drew me since I know how important it is to teach children to focus at a young age. They help kids have fun without using a screen. No technology. No flashing lights. No batteries. I love that my kids can enjoy toys like these for hours each day without seeing any of the side effects of too much screen time. If you’ve never shopped for Melissa & Doug toys before, here a few great toys to try first. I’ve seen positive results with each of my children, and even their friends when they come over to play. Whether they’re in the car, playing right beside me, or alone in quiet time, these toys are a continual source of fun in our home. (and they still play with it). No-Mess Painting Craft. Did I mention how much I love taking Melissa & Doug products on road trips? The kids love painting with these Melissa & Doug On the Go Water Activity Books. They simply use a brush with water inside and the colors appear on the pages. After a few minutes, the colors fade and the children can paint on them again. This has been great for my 3-year-old who can write her alphabet and numbers, largely in thanks to the ABC and 123 Water Activity Books we own. These are only a few options of things your children might enjoy. I shared them because they are the ones my own children have enjoyed. Now, I encourage you to browse around and try one out for your own toddler. I bet he or she will have a lot of fun with it for a long time. 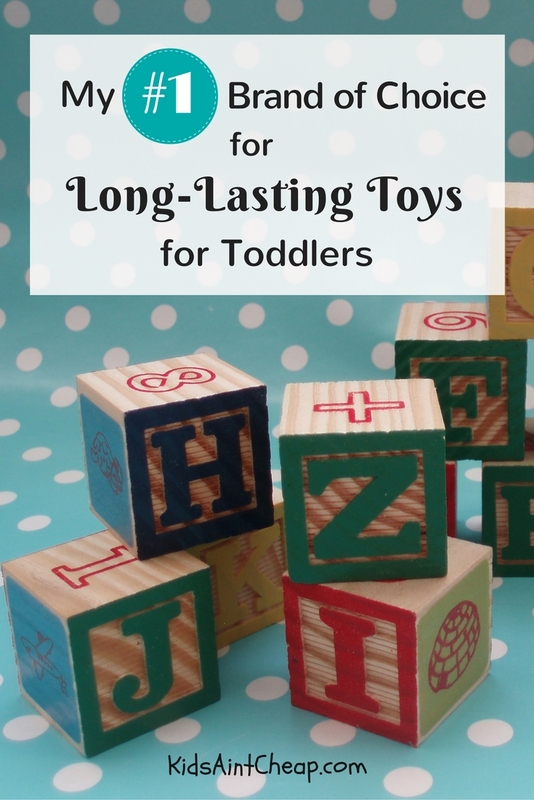 What long-lasting toys for toddlers have you found? Share them in the comments below!